Are you in need of cheap office accessories and supplies? Maybe you work for a company that will go halves on the cost of a new piece of equipment that will make your office feel more like a home. If that is the case, you are lucky! Maybe you are in the process of setting up your own company and you need office supplies to run an efficient business. Maybe you need to set up a complete office for both yourself and any associates that you may employ. Whether you are setting up a business for yourself or for others, there are some supplies that are absolutely necessary, such as a comfy chair, a desk that will hold all your equipment and basic office supplies. Starting up a business can be expensive, so why not take advantage of the upcoming Black Friday sales to get your supplies for cheap? Such a site that offers these cheap supplies is 123Ink.ca, and they definitely are bringing the cheap factor for top-quality products. What are some of these products? Let’s take a look. The first thing any business needs to be profitable and efficient is a desk to hold your computer and assorted supplies. The Black adjustable desk can not only change to 12 different height levels when required but it is also compatible if you working in a standing or seated position. Some people who suffer from back issues may find that it is less painful to remain in a standing position during extended periods of time when there are office duties to complete. If this is the case, it is important that you use a desk that can easily switch between standing and seated positions with the push of a button; and this desk? Does just that. Any successful business requires access to a printer, for invoices or documents, labels or envelopes, fliers or business cards; and access to a fax machine for sending documents to clients that might not have email access or to businesses that provide services to your business. The Pantum M6600NW Wireless Printer is both a laser printer for higher quality documents and a fax machine that allows for programmable numbers, call logs and more. Featuring a USB connection, you can also print documents right from a flash drive for convenience and efficiency. Now that the desk is out of the way, you need an office chair that will not only support the body in its extended seated position but one that will also have a sleek, professional look for potential clients. 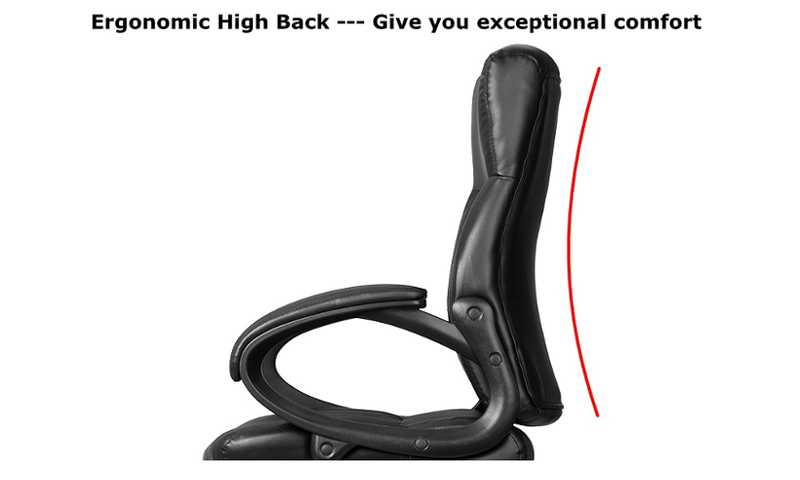 The Moustache Mid-Back Bonded Leather Office Chair is just that. With ample padding and supportive armrests, this chair reaches your mid-back and is covered in a snazzy black leather material that is designed to impress. Do you have documents that you want to show to potential clients, such as your business plans or code of ethics? Maybe you plan to run your business with a personal touch and gift each client their own personalized folder containing all correspondence and documentation pertaining to their contract. The Shuter Showfile Presentation Books, available through 123Ink.ca, are available in packs of 40 for under $10.00 and features two pockets for all important documentation. Setting up your own business, whether it is in the home or within a private office, can be a hassle and no one needs the stress of what supplies are needed when dealing with everything else that is on their plate. So why not head over to 123Ink.ca, arm yourself with the necessary supplies, and rejoice in the fact that your budget wasn’t just blown to bits? Maybe you’ll have enough left over for that fancy coffee maker that brightens each Monday!